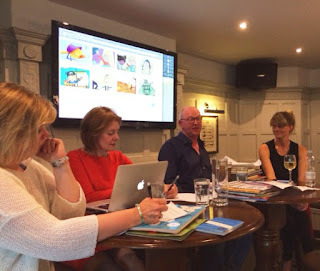 I recently attended a talk at the Savoy Tup, just off the Strand in London, for the first of what I hope will be a long series of Industry Insiders talks as part of the London Professional Series discussing picture books and young readers. On the panel were Emma Layfield, Picture Book Publisher at Hodder Children's Books, an imprint of Hachette Children's; the founder and director of the Plum Pudding Illustration Agency, Mark Mills and much published author Sara Grant, and co-founder of SCBWI Undiscovered Voices. Our host was the former International SCBWI Illustrator advisor, author-illustrator Bridget (Strevens) Marzo whose new picture book is just out with the Tate. The session began with a brief introduction to the history of SCBWI. I’ve been a member now for several years, but had no idea of how far it has come since the days of small gatherings in a volunteer’s house. 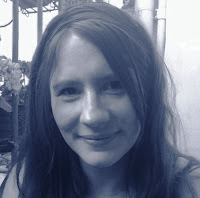 Sara went through the busy up-coming schedule, which includes the Slush Pile Challenge, and this year’s Undiscovered Voices - now in its fifth year - an opportunity for unpublished authors and illustrators for chapter books and older, to have their work judged by a professional panel and possibly published. Sara and Bridget also pointed out the benefits of not only becoming a member but of volunteering for the SCWBI as well: keeping up to date with industry developments, exposure to editors, agents and art directors, meeting new people and supporting your professional development. Mark Mills gave us an introduction to his agency, Plum Pudding, founded in 2006 and he had some hot news. Plum Pudding is opening a literary wing, which will be headed by Fiz Osborne; former picture book editor at Bloomsbury and it will charge standard literary fees. They currently represent an international mix of illustrators (40% are non-UK based). Mark stressed the importance of the international market for children’s book illustrators. The UK is by no means the only market to aim for and illustrators should look beyond the artwork we are familiar with. UK publishers are always interested in export sales: they represent approximately 65% of profits to them, up to 25% in the US and 10% in the rest of the world. Whilst certain markets do prefer a certain style of work, the international market may be better suited to your work, so if you can’t break the UK market, don’t despair! It is an exciting time for children’s publishing, according to Emma Layfield. She opened with the fact that it has, for the first time, overtaken the adult market in profits. 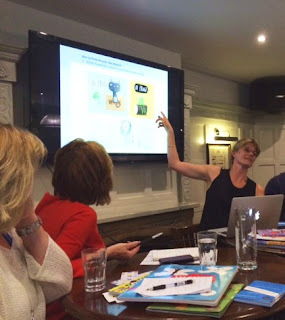 Emma’s excellent presentation talked us through Hodder’s success stories, including Oi Frog! Authored by Kes Gray, illustrated by Jim Field and explained the secrets of their market appeal. The key ingredients, she says, are fun, zany language, rhyme, lots of animals and phonetics. That said, Oi Frog! is untranslatably English – so even titles with no hope of attracting a foreign market can still profitably survive. Hodder like to spend time partnering their authors to their illustrators. Emma told us that they invest in the people they work with and are “in it for the long run”. Stories should draw the reader in so that children feel truly involved. The core age range for picture books in the UK has gone down to 3-5. The UK market is relatively static at the moment; and authors like Julia Donaldson still dominate it, which prefers bright, bold artwork. Books are character focussed with a preference for series titles. Humour is always great and toilet humour is still a hit in the UK whilst being less appreciated in the USA. A greater transatlantic difference is the age range of books. Alongside picture books Hodder are interested in Young Fiction, such as the Claude series by Alex T Smith, which is produced in an interesting new format. The US market has an older core age range of 4-7 years old for picture books. Their books are also character-focussed, standalone titles work more easily and they are more interested in commissioning stunning artwork. Publishers are always looking for Christmas themed stories, so it is worth thinking about this. Seasonal themes fit in with annual retailer slots and though this is nothing new; it is the original ideas and approaches to those themes that will attract a publisher’s attention. Emma’s message to budding authors and artists was to be unique, find your fresh, new voice; use humour and, for creators, have fun. She stressed the importance of giving your first title your all. When submitting you can send a short paragraph about where you envisage the character (i.e. series) going. Know your reader and the age you are aiming for. Try to think about what was important to you at that age, your preoccupations, joys and worries. And if you can, try to spend time with children. The next Industry Insiders event is planned for 23 September, details to be announced soon on the SCBW BI website. There will be guest speakers discussing topics like how hard it is to get published, the difficult second book and what agents like in submissions. Egmont Publishers have invited us into their offices on 10 November for an insider view on publishing. This event proved so popular it sold out in a matter of hours. Thanks for the write-up Sarah. Very interesting! Do you know if Plum Pudding are looking to take on Picture Book authors in their new literary wing, or is it author-illustrators only? Thanks for this, Sarah. I wanted to be there but couldn't make it. Very enlightening (and hopeful).